Cool joint for an after work drink in the CBD. The Boheme was reviewed on Thursday 3rd November 2011 20:32 by Richard. As any Perth local would know, walking through the front doors of The Bohème a year or so ago and you would've been treated to quite a different sight to the one you see today. In this iconic location once stood possibly the one and only truly Australian themed CBD pub, Bobby Dazzlers. Old dingy booths have now been swapped out for large leather couches and much more of an open feel. The sea of high-vis work gear and steel-cap boots have been replaced by suits and black shoes. The pub has undergone a drastic refurbishment re-opening it's doors in January 2010 as The Bohème Bar & Restaurant. The transformation from an Aussie pub to a chic inner-city bar has been carried out really well, especially if you can remember what it used to look like. The décor is inspired by the allure of the roaring 20’s with chilled out 'Lounge' music level playing at just the right volume. Bar service is quick and staff were friendly and seemed like they actually wanted to be at work. Drinks are reasonably priced, although, they don't serve pints (570ml, instead offering either a large (schooner - 425ml) or a small (middy - 285ml). This seems to be the latest trend in Perth's inner-city bars and I'm not sure if it's a profit boosting scheme or an attempt to quell patron violence. Whatever it is, it's a bit cheeky selling less beer at a disproportionately cheaper price (i.e. the price is lower in total but still more expensive than if they were to sell you a pint). That aside, drinks were still reasonably priced, however, food was more on the expensive side. We ordered a spiced lamb pizza and some wedges to share and it came close to $40. The food was ready fairly quickly and as there is no table service we had to go up to the bar to collect it (and the cutlery). The pizza was really tasty, full of flavour and a generous amount of toppings. The wedges were pretty standard as wedges go. My only complaint on the food side would be that the pizza was advertised as a 'large' and all I can say is you would probably need a magnifying glass if you ordered the small. We hung around for a few more drinks after our meal, there are plenty of places to sit during the week, including the standard CBD alfresco/street-corner affair when it comes to outside seating. You wouldn't expect to get a seat after 5 on a Friday as it fills up pretty quickly. The crowd was made up of mostly city workers, with the average age being about 30 -35. Overall I was really pleased, there was a great selection of drinks and the whole placed just had a really chilled out vibe. Was not too sold on the food aspect though but I might change my mind after another visit or two. I would defiantly recommend The Bohème to friends looking for a good spot for an after work drink in the CBD. 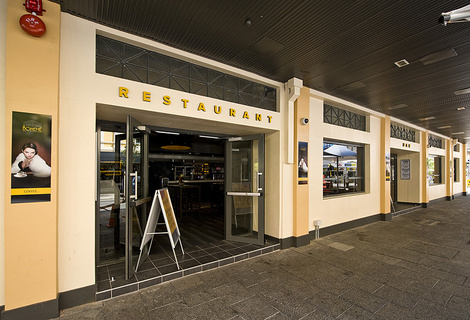 5/10The Aviary in Perth, WA (16m away)Central rooftop bar with great views of the city.